Oops - we don't appear to have a video for the DR-2050C. It is Portable, can scan fair amount of documents quite quickly and has small footprint which is ideal when ‘hot desking’ visiting various operators to collect information. I use Scansoft, Paperport Pro to organize, find and share paper and digital documents. Only slight criticism is the paper guides don’t always keep paper from skewing. It is still working well. A good simple straightforward unit. Easy to use and unobtrusive on a busy desk.. Software is easy to use. As a basic scanner adequate. For document feeder a reliable, fast unit at LOW resolutions. Unfortunately at 400dpi+ fairly slow. Most printers are now capable of 600dpi+ so for near reproduction quality 300-400 dpi required at a minimum. Taking a look at Google Books and they have clearly used only a 150/200 dpi scan and most pages are blurred, not easily read etc so 200dpi is NOT sufficient despite what marketing folk may have everyone try to believe. The Canon drivers are relatively stable but far from good. They provide basic services, crash occasionally and have a really annoying reset that clears all the settings every time you load. You can save various profiles but not being able to set a default profile wastes a lot of time. The other problem with the drivers is the intermittent AutoFeed at start – sometimes it will scan the 1st page sometimes it skips it. You can fiddle about with various buttons every time to guarantee a 1st page scan but yet again wasting time. Should be able to load a set of documents, start scanning, done – it is never that simple. This is a general problem with all Canon drivers not the specific one for this scanner. Not a critical problem at the moment but becoming critical in 3 months – NO planned 64-bit windows support and NO planned Vista support. First of all the tradescanners website was a joy to use. It had all the essential information I needed to research the scanners. This included, apart from the price, essential technical info. Secondly, the staff at tradescanners were delightful. Kept me informed on the progress of my order. Also they were the cheapest. (NO they are not paying me to say this). 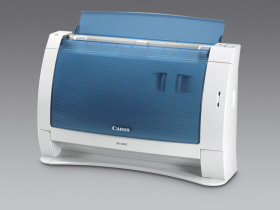 Thirdly, the scanner, Canon DR-2050C is a joy to use. Its small, smaller than my 17” laptop. Its fast. It does duplex scanning. To get the most out of it I would recommend the Scansoft Paperport software. The software that comes with it is OK for home use but for any professional use you really need Paperport. Combined with my laptop and the scanner I have a virtually paperless office. I do not have stacks of filing cabinets. The only small gripe is that sometimes the papers get jammed. When this happens, Paperport goes loopy! But this only happens occasionally. The Canon 2050 Scanner works very well but setup is a little confusing and I have not been able to scan directly from the scanner. Scanning from the computer works fine. With its compact body, streamlined shape and ultra small footprint, the Canon DR-2050C document management scanner fits neatly on a counter, shelf or desktop corner. Benefit from productive scanning for a wide range of applications, in the smallest possible space. What's more, it comes complete with a rich range of easy-to-use features. The DR-2050C scans at a fast 20 pages per minute (A4 portrait, simplex, black & white or greyscale, 200 dpi) to speed up your document workflow. It offers same speed duplex scanning at 39 images per minute, with the added advantage of colour capable scanning. With the unique Folio function, you can even scan larger documents right up to an A3 size. Simply fold them in half and both sides of the folded document are scanned and then automatically combined into one seamless image. You benefit from a high optical resolution reaching up to 600 dpi, to ensure consistently superior image output. The DR-2050C minimises image distortion, due to an innovative CIS sensor and lens array mechanism. This revolutionary design also cuts overall energy consumption, eliminates warm-up time and makes the scanner body frame more compact. Plug and play simplicity, clear control buttons and a range of user-friendly features ensure effortless operation. The durable and dependable DR-2050C guarantees reliable operation. Canon's unique retard roller mechanism achieves highly reliable separation and feeding of documents for productive paper handling - while preventing any problems due to partial double feeding or dust damage. Bundled software for the DR-2050C includes ISIS/TWAIN drivers, Adobe® Acrobat® 7.0 and CapturePerfect - providing extensive scanning and saving functions. With "Scan Batch to Mail", scanned images can be instantly attached to a new message for multiple sending, using your existing email programme. You can also create PDF files through built-in OCR functionality, which converts printed text into text data that can be searched using specific keywords. So you save even more time and effort.